The depart­ment offers a wide range of modern facil­it­ies for the eval­u­ation of the micro- and nano­struc­ture. There is large exper­i­ence avail­able in the exam­in­a­tion of space­craft mater­i­als both, for the char­ac­ter­isa­tion of the micro­struc­ture and for fail­ure invest­ig­a­tions by correl­a­tion to macro­scopic prop­er­ties. Numerous ceramic, metal­lic and organic space­craft mater­i­als were invest­ig­ated. 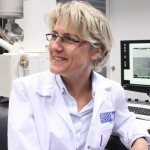 The integ­rated system provides an abil­ity to create, modify and char­ac­ter­ise complex struc­tures even in nano-scale. Using a focused Ga2+ ion beam, it can precisely remove or deposit mater­ial at the sample surface as well as image the sample surface produ­cing high qual­ity contrast images with high magni­fic­a­tions. for eval­u­ation of mater­ial beha­vior exposed to tribolo­gical forces – break­ing, deform­a­tion and delamin­a­tion processes, mater­ial trans­fer, phase trans­form­a­tion in the deformed areas. for determ­in­a­tion of precip­it­ates, inclu­sions and fibres distri­bu­tion in nano-composed mater­i­als. Preparation of Atom Probe Spectrosopy slim needles with tip radii in the nm – range using patterned FIB milling. 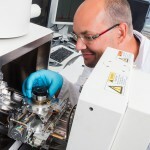 Micromachining – prepar­ing and provid­ing of speci­mens for micro – mech­an­ical tests. 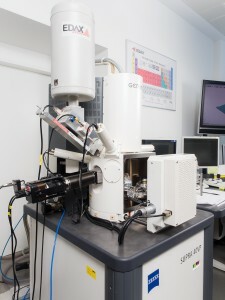 The integ­rated system EDS/EBSD (Pegasus) imple­men­ted in the HRSEM enables simul­tan­eous collec­tion of EDS (chem­istry) and EBSD (crys­tal­lo­graphy) data, allow­ing direct correl­a­tion between the elemental content and micro­struc­tural aspects of the mater­ial being stud­ied. Figure: EDS line-scan show­ing elements distri­bu­tion along a coat­ing system.